When a word perfectly captures a human truth, humans respond to it in the same way that they respond to a beautiful melody. They smile. They nod their heads. 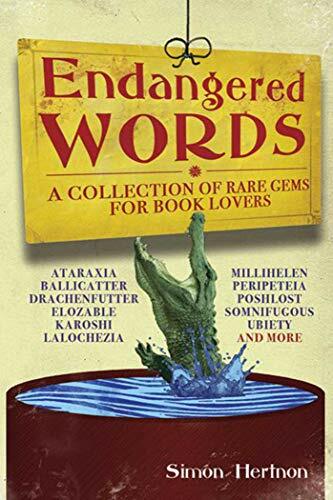 They tell others of their discovery.” So says Simon Hertnon in his introduction to Endangered Words, and after wrapping your tongue around the lexical rarities he offers up to his readers, you’ll have to agree! Hertnon provides one hundred hand-selected rarities, and, in a virtuoso display of concinnity and logodaedaly, breathes life into them with his lucid descriptions of their meaning and engaging examples of their usage. Thanks to Endangered Words, you no longer have to be at a loss for words or reach for the clichéd and commonplace. The English language is brimming with ambrosial alternatives, and this compendium offers the cream of the crop. Filled with words to be treasured for their elegant precision, from anacampserote to sprezzatura to zemblanity, Endangered Words is the perfect handbook for writers, an excellent resource for communicators, and an entertaining read for anyone with an appetite for the very brightest gems of the English language.